Most of the children’s books at our library are organized in bins by author. It only took a few times of desperately flipping through the bins to no avail before I started reserving books. Most weeks I generally request a few books that relate to something currently in our lives. We’ve been eating up lots of berry books right now which was the inspiration for this Strawberry & Dried Cherry Crisp. Little Mouse is desperately trying to save his strawberry from the Big, Hungry Bear, and outwits the bear by sharing it with the reader. This wordless book allows much for the imagination and encourages Narrative Skills, an important pre-reading skill. The author won a Caldecott honor for the illustrations, which have a surrealistic, almost spooky feel to them but stir lots of conversation. 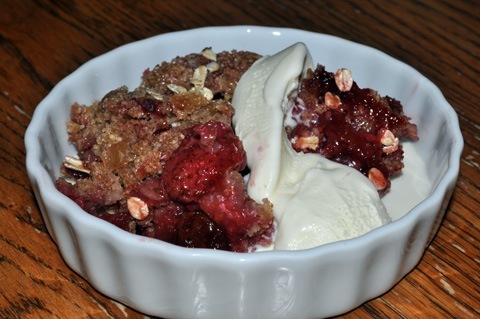 Recently when having an impromptu dinner gathering, Skoogie pulled out her chef hat and apron, pushed up a chair and announced she was ready to help make this Berry Delicious Crisp! It was rather cute when she showed the place to hold your thumb on the pastry cutter to our friends. Combine all the ingredients in a bowl and then place in 9 x 13 glass pan. Mix together the flour, oats, and brown sugar. Then cut in the butter with a pastry cutter (you could use a food processor, pushing buttons is equally as fascinating to kids). Add 1-2 T water until mixture becomes crumbly. Add the topping over the filling and then sprinkle the crystalized ginger evenly around. Bake for 25-30 minutes until bubbly. Serve with ice cream and enjoy!